On 10 and 11 February, we attended the #notwestminster conference in Huddersfield, West Yorkshire. This event brought together tens of people from local authorities, universities and tech startups to attend a series of design experiments and workshops centred around strengthening local democracy – however far we happen to be from London. We found the event thought-provoking and it really got us thinking about our work in digital civics, and in particular our work around digital local democracy. The first day operated like a mini-hackathon – get a bunch of people in a room to make things in a short space of time. Having been victorious in our attempt at the marshmallow challenge, we went from strength to strength and worked in our team to come up with a design provocation or “experiment” around enhance local democracy. Whilst other teams were designing apps and digital tools for participatory budgeting, our team took it back to basics and came with something rather analogue – a box that could be used to collect in-situ views on a design proposal, but would encourage two-way interaction with the comments to begin a conversation around local issues. We all felt that citizens simply “having their say” by depositing comments in a black-box fashion did not truly represent local democracy, so we sought to challenge this by subverting the typical interaction one would have with a voting box – by being able to take your comments back out of the slot! 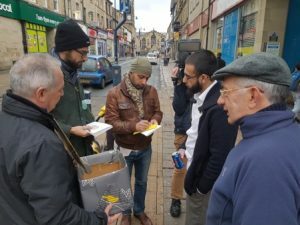 We trialled our design experiment on the streets of Huddersfield to great effect, and we seemed to generate a lot of interest standing outside the local shopping centre! The second day was the main event of #notwestminster, consisting of a series of talks and workshops. The ‘lightning talks’ covered everything from how community work and engagement in local groups can foster active citizenship, and how a council of the 21st century can look, to a very personal and inspirational account of working with the former MP local to Huddersfield, Jo Cox. Participants could then freely choose three out of a total of 13 one-hour workshops throughout the day. The topics covered were again broad, with a focus on how councils can better collaborate with citizens and communities. We attended workshops on better handling discussions around local issues through software-based argument mapping, how hyperlocal conversations in action can enable self-organisation of people, and on citizen engagement strategies for councils. We also attended an interesting psychogeographical walk to three places in the neighbourhood. On the walk we were asked to reflect our feelings for the place through a questionnaire and a discussion afterwards. This fun and fascinating experience can be a valuable tool for our own work around place-making and understanding the significance and richness of places to communities and visitors. We both found the conference to be very engaging and not like anything we had attended before – bringing together a diverse range of democracy practitioners and researchers to exchange ideas and knowledge that we could take back to our digital local democracy work here in Open Lab. We look forward to keeping in touch with the contacts we made, and hopefully returning again next year! Written by Sean Peacock and Sebastian Prost. Since the start of November members of the public have been sharing their ideas for the future of the Tyne and Wear Metro. As part of a massive public consultation into the design of a new generation of Metro carriages, the Metro Futures project – a collaboration between Nexus, who own Metro, and Open Lab – aims to ask people what they like about Metro, and what they would like to change. Metro users – and potential users – are being invited to share their views on the Metro Futures website, in pop-up labs held throughout November across Tyne and Wear, and on social media, using the hashtag #MetroFutures. “We want local people to tell us much as possible about what they want to see from new trains,” explained Huw Lewis, Head of Customer Services at Nexus. Around 30 members of the public have also been recruited as co-researchers. They will attend four design workshop and think in detail about Metro today and what the Metro of the future could look like. The ideas coming out of these workshops will also be added to the Metro Futures website to prompt further online discussion. Local schoolchildren will also be involved in the design process. They will spend time on a spare Metrocar to explore new ideas, echoing the role of children in testing out the original Metrocars 40 years ago. Involving local people in decision that affect them is a key theme within digital civics, and the Metro Futures project aims to bring back the spirit of innovation that characterised the early days of Metro. The ideas and feedback from the public will be used to design the new-look Metrocars, with a detailed business plan expected to be presented to the Department for Transport before the end of the year. The current Metro carriages have been in use since Metro opened in 1980, so the new designs will shape the look of Metro for decades to come. For more information please contact Simon Bowen. How do you find willing participants for a design workshop to develop a mobile application for people who stammer? You crash their national conference, of course. While putting the user at the centre of the design process is a great way to ensure that the end product will actually be something which interests them, this becomes a whole lot more difficult when willing participants can’t be found. Undertaking design workshops with people who stammer can be tricky if people do not want to contribute. The nature of stammering is such that many people do not wish to disclose or discuss their stammer. Stammering is characterised by dysfluencies in speech, alongside possible secondary behaviours such as facial grimacing and social avoidance. Our attempts to find participants within Newcastle yielded only a few names. However, when the British Stammering Association (BSA) heard of our search, they offered us the opportunity to attend their national conference being held in Manchester in early September. The BSA is the national charity for people who stammer in the UK, advocating for and raising awareness of stammering. Every two years the BSA hold their national conference, bringing the stammering community together from across the country (and beyond). While research and therapy also features, the primary attendees of these events are people who stammer themselves, ready to socialise, share their experiences and learn from their peers. And, with a conference full of people who stammer who are willing to engage in discussions related to their stammer, what better place to find participants for our design workshop? We piloted our workshop in Newcastle with two participants and received their feedback on the activities with the view to adapting them to suit a potentially larger group in Manchester. Then we took the show on the road and secured a room for the Friday evening of the conference. Despite being a late addition to the programme, our event was added to the official schedule, advertised as the first workshop of the conference, and we were given a whole lecture theatre to run it in. We had 15 participants across three tables who were asked to complete discussion-generating tasks, before coming together as a larger group to share ideas. In attending the conference, we were able to reach people who are open to talking about their stammer and sharing their experiences. Conversation flowed at all of the group tables and loads of great ideas came out of the workshop. Now, their input can be used to develop a mobile application which will hopefully aid an even broader range of people who stammer. 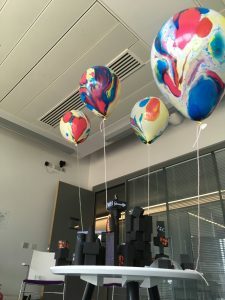 Each year doctoral researchers from Digital Economy Network Centres for Doctoral Training across the UK have a chance to come together, learn, and enjoy a city in the summer at an annual Digital Economy Network Summer School funded by the EPSRC’s Digital Economy Network. This year this fun and informative exchange happened in Newcastle between 17-20 July 2016. This year’s theme, Digital Citizens, Connected Communities, explored how digital technologies could be used to empower communities. Across four days, CDT students listened to inspiring keynote speakers, attended master classes, organised and took part in student-led workshops, asked the speakers difficult questions during a panel discussion, and attended a range of social events that included bowling and a boat trip along the Tyne! Some of them took this opportunity with both hands: students organised and carried out seven workshops, across topics ranging from thematic analysis to conversations on ethics or digital democracy, and even a linguistic inquiry into what the Digital Economy actually is. It was “a really good idea to have this interactive day rather than just listening to speakers”. It doesn’t come as a surprise that the workshops, the masterclasses, social events, and all the tea and coffee breaks were some of the things that people described to be the ‘best things’ about the summer school. It was just great “how we all bonded all together”! But let’s move on to the other great thing, the speakers! We were honoured to have four fantastic invited speakers: Mimi Ito told us more about connected learning, Christopher Le Dantec introduced us to new forms of data-based participation, and Brett Scott told us all about how we could hack the future of money. Gregory Abowd told us what an applied computer scientist could look like, and Elizabeth Losh closed the summer school for us by discussing affect and digital pedagogy. “That’s hard to choose. I really like the masterclass I attended, but some of the side conversations and social events were as memorable”. Doing research is difficult, and no amount of training is going to prepare us for every single potential ethical question or incident in the field. While applying for ethics approval from the university is supposed to help you think about potential issues that may arise in your research, they don’t always make you think about all the little details, the small things that can happen when doing fieldwork. When looking at ethics as a constant conversation you are having with yourself, your supervisors, your colleagues, and maybe even the ethics board, it helps you address these conundrums that come up through the process; the invisible questions. These conversations are hard to have with colleagues or supervisors, let alone the official ethics board of the institution, as many of the issues that come up may be very personal and complex. On top of this, it seems to be that safe, judgement free spaces to talk about these types of issues openly are also sometimes lacking. To address this issue, three PhD researchers from HighWire Centre for Doctoral Training Centre at Lancaster University and Centre for Doctoral Training in Digital Civics at Newcastle University put together a workshop for other PhD researchers studying in Centres for Doctoral Training (CDTs) within the Digital Economy Network (DEN) at the annual DEN summer school – this year hosted by Open Lab at Newcastle University in July 2016. This workshop was an opportunity for researchers to have a safe space to address any ethical questions, conundrums, or concerns that they may have come across in their work so far, or are worried they may come across in any of their future work. Since we knew this was going to be a difficult topic to talk about, we addressed the topic in a serious, but fun and creative way: we built a city of ethical conundrums. Using ideas from anarchist and critical pedagogies where embodiment, creativity, reflexivity, communication, and collaboration are important, we came up with the idea of creating a common language among participants to talk about these personal concerns. The workshop started with a short activity to get to know one another, and a longer conversation on the importance of safe spaces including how we were going to make sure our workshop was a safe space. After this, there was a short period of individual reflection where participants created unique pieces of art to represent their own ethical concerns in silence. After sharing these with the rest of the group, the building of the city began. Starting with simple language and concerns, we used black building blocks and markers to document the conversations that came out of the individual presentations. 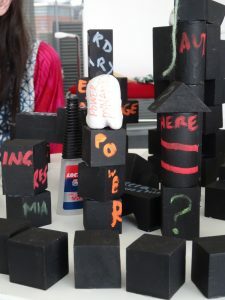 To address invisible issues that arise throughout the research process we added little clay ghosts, and to further complicate the conversations we ended up building in some Lego figurines to populate our city of ethical conundrums. After all these conversations, we tied balloons to the ghosts and came up with strategies of addressing these invisible issues. At the end of the day, we ceremoniously popped these balloons to let the glitter that had been filled in them fall onto the hostile-looking city we had built throughout the day. This made the city prettier and shinier, adding to the metaphor: while the kind of research we are doing in sensitive settings is difficult and at times may look hostile, when we talk about and address these concerns the research will be less hostile and more beautiful. This workshop helped us learn from one another’s concerns and allowed us to address many difficult issues in a safe environment. It was a great opportunity to exchange experiences, reflect on ethical implications of previous, current, and future projects, and to engage in discussions around these concerns. We were able to map commonalities between the different research projects we discussed in the workshop, and to see that while all participants were working in very different environments, many of the ethical concerns appeared in all of our work. The safe space we created through the workshop allowed us to address both very detailed and unique concerns, but also broader ethical issues we see in academic research as a whole. This article was originally published on womenareboring.wordpress.com on 3 August 2016. For more information please contact Angelika Strohmayer. My research set out to explore how people with disabilities experience using maker technologies for their own purposes. By “maker technologies” I mean both personal-scale fabrication tools (such as 3D printers and CNC laser cutters) and prototyping toolkits (for example, electronics combined with microcontrollers) – so basically the same equipment that most maker spaces acquire for their members to use for their individual projects. In theory, these technologies enable makers to build whatever they want. People with disabilities could thus benefit from these technologies by creating their own affordable and personalised DIY assistive technologies. However, previous research has found that in reality it is seldom the people with disabilities who are creating such designs. In my research I questioned why this is the case and experimented with different ways that maker initiatives can be set up to be more accessible, so that people with disabilities can actively take part in them. Informed by literature from Disabilities Studies, I chose to apply an action-oriented approach which refuses to set disability on the same level as inability to use maker technologies. The result was a series of maker workshops with and for people with different physical impairments. 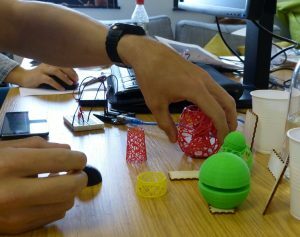 In five sessions participants were offered opportunities to learn how to use different mainstream maker technologies (that is 3D printers, laser cutters and programmable electronics) and to work on their own individual maker project. Designing, organising and running these workshops facilitated gaining practical insights on the significance of specific social, material and technological factors for the accessibility of making. At the same time, specific potentials of empowerment in the context of making and disability could be identified by paying close attention to the participants’ experiences. The participants showed a lot of interest in the technologies and demonstrated a steep learning curve while working with them. During the engagement all participants were able to create several designs and fabricate them as material objects. Examples of these creations were puzzles, keychains, badges, a wall decoration, a zipper extender and a tick fork. Those who participated in the electronics session even learned the basics of programming in the Arduino framework and applied this knowledge to create a button-triggered traffic light system consisting of LED-lights and a sound buzzer. These creations demonstrated a variety of ideas, different approaches to the making process, and good general understanding of the taught basics. Indeed, the study results seem to support claims of empowerment through making to a certain extent. However, it is important to consider that this is more related to the specific practices of using such technologies than to the technologies by themselves. For more information please contact Janis Meissner.